1. 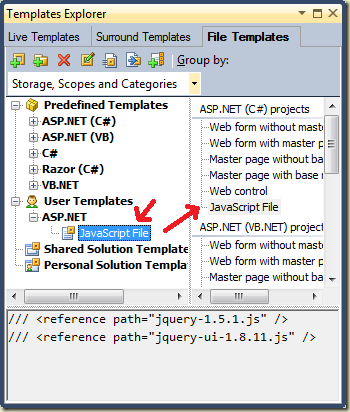 Go to ReSharper menu in Visual Studio and select "Live Templates...". 2. In the Templates Explorer dialog, go to the File Templates tab. 3. Right click the User Templates node and select New Template. 5. Fill out the default filename field. A name like script.js will work, because you'll be able to change the name when executing the template. 5. Click the available “in everywhere” link below the description. Uncheck “Everywhere” and select “ASP.NET” (so the template is only available for web projects). 7. Finally, to get the template to appear in the Alt+Ins menu, you need to drag and drop the template into one or more of the project areas on the right. In the screen shot above, the template is in the ASP.NET (C#) section. Taking a few minutes here and there to customize your environment pays a nice return on the investment.